Bar Harbor is on Mount Desert Island, the largest island off the coast of Maine. The year-round population is small – approximately 10,000 residents – and increases seasonally with part-time residents and tourists. The primary destination for tourists is Acadia National Park, followed by attractions like the Abbe Museum and the picturesque village itself. 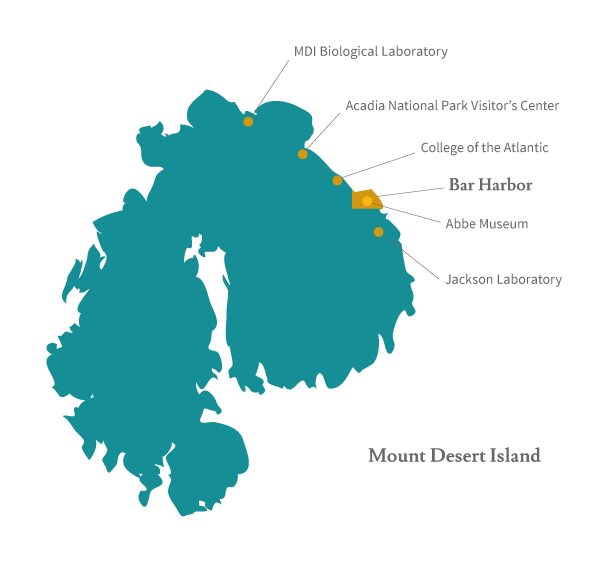 Aside from the hospitality economy, the major employers and economic anchors are nonprofits: College of the Atlantic, Jackson Laboratory, and MDI Biological Laboratory. As the largest outlet for Maine basketry in the state, the Abbe generates significant cash returns for Wabanaki artists because of the high number of visitors who travel to the area each year. Who are the Wabanaki? | What is Decolonization?